The main aim of the proposed research is to design next generation membranes that can deliver clean water for future generations with a smaller energy footprint. This will be achieved through molecular engineering to exploit nanoscale fluid phenomena to generate ultra-efficient membrane designs. At a fundamental level, molecular dynamics (MD) simulations will be adopted as the technique to assess membrane separation performance. Graphene and CNT research has attracted major attention over the past few years due to these materials having outstanding mechanical, electrical and thermal properties. 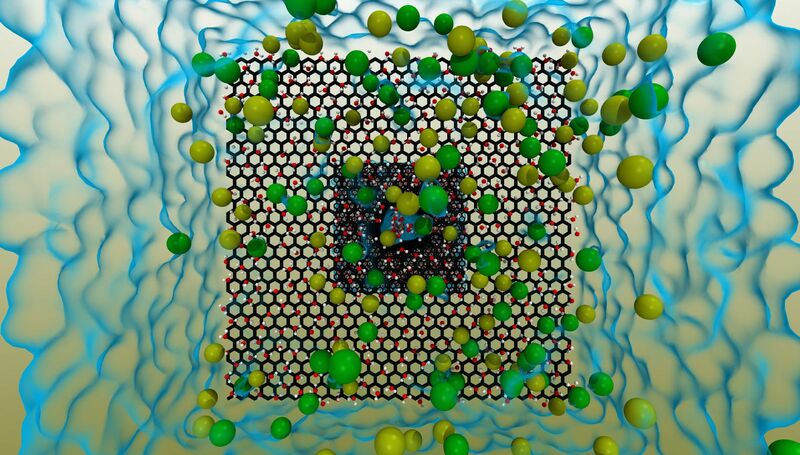 It has also been shown that water permeability of these materials is several orders of magnitude higher than conventional reverse osmosis membranes, suggesting that nanoporous graphene and CNTs may have a valuable contribution to make to future desalination processes. Figure 1. Molecular dynamics simulation of the reverse osmosis process. Created by Konstantinos Ritos of the James Weir Fluids Lab (http://www.jwfl.org.uk). All MD simulations will be performed using OpenFOAM, an open-source CFD code which has been extended by our group to include a molecular dynamics solver. Due to the extreme computational overhead associated with MD, we will be utilising the outstanding processing power of ARCHIE-WeSt. For further details please contact Dr William D. Nicholls (william.nicholls [at] strath [dot] ac [dot] uk), Visiting Researcher at the Department of Mechanical and Aerospace Engineering at the University of Strathclyde.